One of my greatest joys this summer was watching you swim in the ocean. And, lucky for both of us, you did it often and with gusto. Gone was your hesitant entry. Your anger at surprise dunks. Your thin skin in cool waters. This summer, not only did you run at each wave with confidence and excitement, you seemed completely at peace with the ocean and your place in it. But now summer is behind us, and you’re off to your first day of middle school. I know, this big sea of new faces and experiences can feel overwhelming. But there’s no question that you’re ready for this next set of bigger waves in your life, too. The ones that come with a bit more risk, but a lot more reward. I hope you’ll be able to think of your salt-water adventures as the perfect parallel to becoming a middle schooler. After all, you’ve learned that each time you step foot in that water, fun awaits. Sure, sometimes the water is cold. So much so that it makes your muscles tense and your caution bells sound. But you know that, in time, you adjust. And before you know it, the goosebumps give way to great tales of triumph. You’ve also discovered that each wave is an opportunity. For the most part, whether you go for a ride or wait it out is up to you. Sometimes you start small, and are surprised by how — what seems like a little nothing — sweeps you up and takes you a great distance. Other times you realize a set is a bust, and you have to travel out a bit deeper to tackle bigger challenges. Ones that give you unparalleled thrills and momentum. And, yes, now and then there are some waves you simply miss — no matter how prepared you are, or how hard you’re trying. That disappointment? It can feel even bigger when you see other people whooping in celebration at their own achievement, leaving you behind. But the waves keep coming. They always do. I’ll be honest. The part that’s hardest for me as I watch from the shore is how the current can so easily pull you one direction or another — without you even realizing it. You get so far away and lose sight of us. But without fail, you eventually look up and see that you’ve veered too far from where you started. You know it’s time to come back to your people. The ones who are looking out for you, cheering you on, maybe even giving you a pointer you when you need it. That’s when you get out of the water, and work your way back toward us — share a story or two. Somehow you always manage a smile, even when a wave gets the best of you. But most of your stories are about how you tried something new (and succeeded! ), or gave someone else a hand along the way. 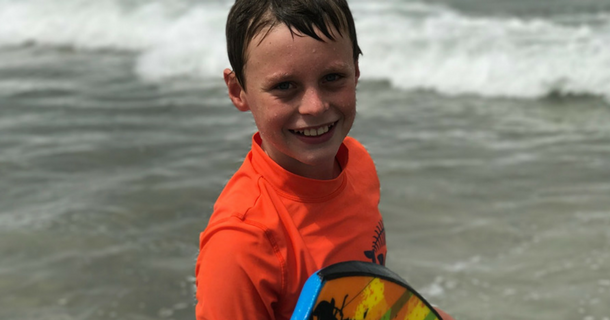 Big, if you take on middle school like you did the many beaches of California this summer, you have a whole lot to look forward to. You’re about to enter an exciting new world of opportunities, choices, and adventures. You’ve got the strength of character and experience you need to really go for it out there. My wish for you is that each new experience is a thrilling ride, and that you always remember we’re cheering you on from the sidelines — ready to offer you a warm, soft place to land when you need a break from it all.